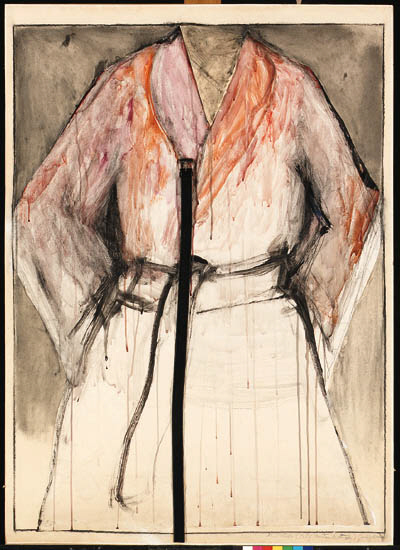 Red Robe (Self Portrait Study) is among the first examples of the bathrobe self-portraits from 1964. Here Dine reveals both his roots in the Abstract Expressionist movement of the previous generation of American artists, as well as his position as one of the originators of Pop art. The portrait is implied, not by a traditional visual likeness of the artist's face, but instead through his possessions, both simulated (the robe) and actual (the belt), as well as in the active gestures of paint.